What a mess! This page, my life! Boxes and bins multiply through the house as we make our final push to pack for our move from New York to Connecticut. My desk, my art supplies: dismantled, boxed, and wrapped…for now. And so no lovely birds, no gardens, no carefully observed scenes until the chaos subsides. 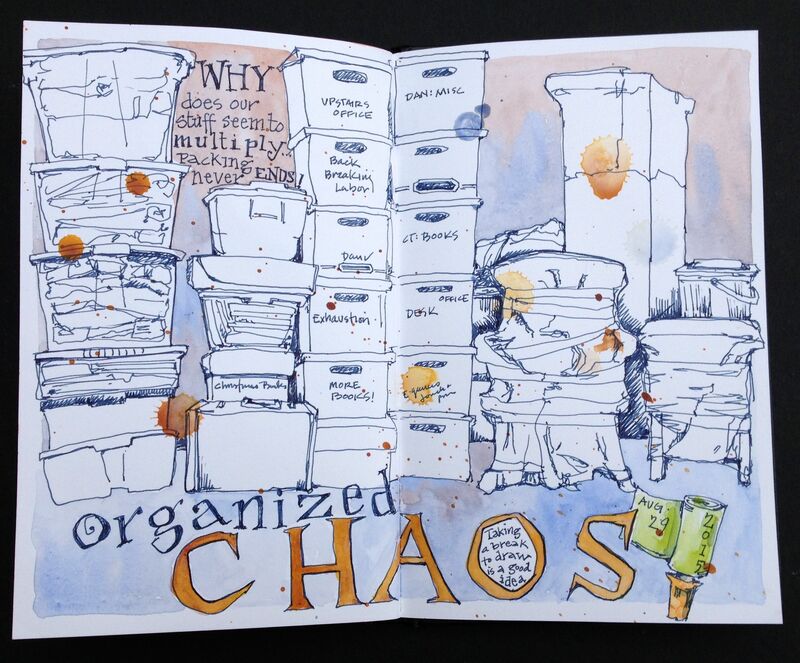 This entry was posted in Journal and tagged sketchbook by Jean Mackay / Drawn In. Bookmark the permalink. Hang in there! This must be a very challenging time for you… I am holding you in my heart! Thanks Ellen! It’s all coming together (but first it’s all coming apart). A beautiful drawing of chaos Jean. Good luck with your move. Thank you Sharon! Hope I’m drawing something better soon! You make the organized chaos look like a work of art. Very nice! Thanks! One week to go. Then a bit of limbo, then move in. I’ve got a small portable art studio that’s not going on the truck– sanity! Oh Jean, I’m feeling all your frustration and exhaustion. Holding you close. Remember to be gentle with yourself. I do like the paint blots! Hey! Thanks for reaching out! A few more weeks (months?) and we’ll be settled. Moving in has got to be easier than moving out! I’m ready to be on the other side. The sketch is great, and the box labels made me smile! Hang in there! Love it, Jean!! Brings back memories of moving to Maine and the moving company underestimating the size of the truck needed!! Looking forward to the drawing where you’re happily ensconced in your new home gazing out the kitchen window at the trees and birds. All is well on the island – hectic but well. Friends of Hog Island – Promises made; promises kept. I look forward to that sketch, too! Glad all is well on island! Lovely drawing. Chaos well caught. Jean, I started following your blog in recent months after Shari Blaukopf mentioned your wonderful and beautiful use of calligraphy in sketches. I have been captivated ever since. Good luck with the move, and I, along with your other admirers, will look forward to the first sketch in your new location. Cynthia- Thanks for writing! I am rather in awe of Shari Blaukopf’s work and I’m so glad to know that you have been “drawn in” by mine. Thanks for your good wishes– I look forward to that first sketch in CT too (probably about two weeks out).